Da Gama Maritime’s Managed Chart Outfit Service is a fully integrated navigational data management service designed to ensure your vessel or fleet is faultlessly compliant with the relevant regulations and ready for inspection, at any time. Tailored to your vessel’s specifications and fully flexible according to your individual requirements, our Managed Chart Outfit Service streamlines chart supply and update processes, reduces the risk of error and facilitates greater budgetary control. More importantly and where we believe we stand head and shoulders above our competitors, our account managers look after a limited number of vessels to ensure they don't just know what you need, but they know the team on board and can therefore build a much more personal relationship through regular contact. Vessels who sign to our navigation management will receive a bespoke folder which provides among other things, details of their outfit, holds copies of electronic licences on a designated USB, has sleeves for the necessary data discs and guidance on the ways to maintain an outfit to the highest standards in the most time efficient manner. Assessments form an essential part of the managed chart outfit service, providing a trail for compliance purposes and an opportunity to fine tune your navigation operations. An initial assessment is conducted on board your vessel to record the charts, publications and licences you hold. These are then entered into our Outfit Management Service (OMS) through your dedicated online account for easy reference and future online ordering. Subsequent assessments are conducted where possible on an annual basis however this is on top of the close liaison your dedicated account manager will have throughout the year. Our automated update service alerts you to updates of new edition charts and publications for those you hold on board. If you've left charts in storage with us, new editions will automatically be placed into the outfit when you call for its return on board. By ensuring you are always in possession of the latest editions of your chart or publications, regardless of your location, you need never worry about missing a vital update or falling foul of regulatory standards. 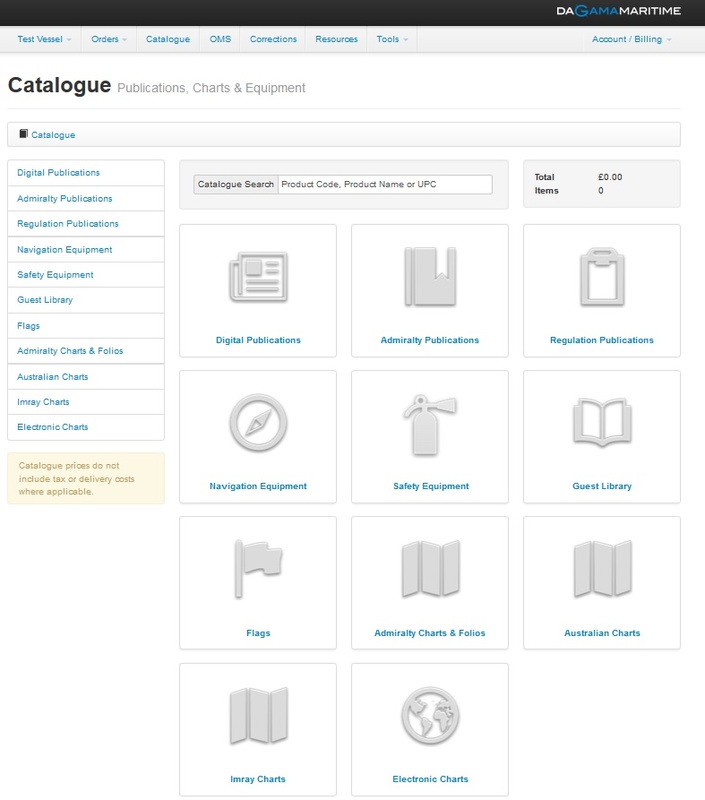 Clients signed to full management can access our on-line catalogue for placing orders directly. With a constantly growing product range now expanding across navigation and fire related stores, you'll find we provide you with the most professional stores and if you can't find what you want in our catalogue just let us know and we'll source it for you. As an ADMIRALTY distributor for the UK Hydrographic Office, we can supply you with all paper and electronic stores and licences including AVCS, ARCS and ECDIS. Similarly as we work with a number of other electronic chart providers we can support requests for at least Transas, C-Map, Navtor, Garmin and Navionics. By placing your non-operational folios into our insured onshore storage facility and limiting the number of folios you store on board to only your current operational area, you can significantly reduce the maintenance time of your outfit which can also prove to be a psychological advantage too. We will then return the folios to you when required, fully up to date. With our managed outfit service, you can obtain an instant overview of your outfit status; print reports of checks and updates as well as place and track orders on line with our dedicated account management system. Always accessible when and where you need it. Our service is 24 hours a day which means we can accommodate requests for charts and supplies at short notice and deliver them to you, anywhere in the world with minimal delay.